You can’t miss the orange flowers of this jewelweed, but look closer to find the seedpod hanging below and to the right of the third blossom. 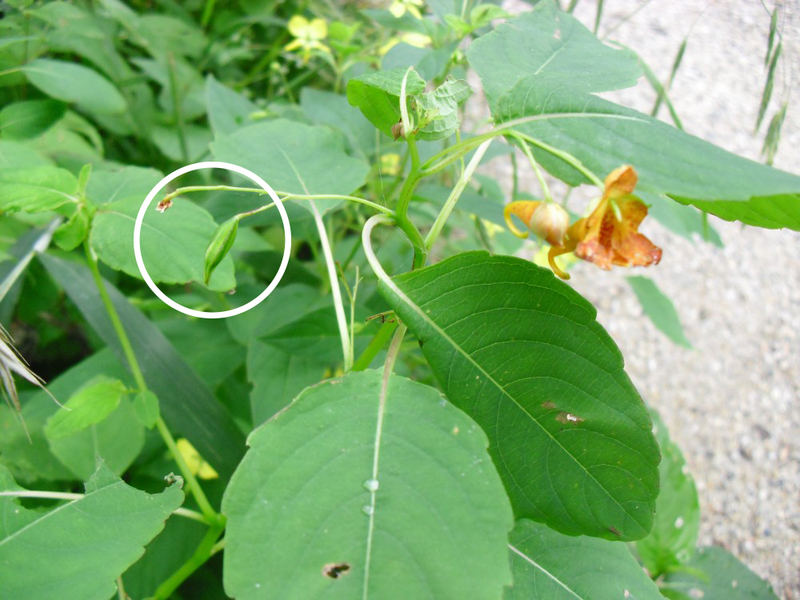 Its scientific name is Impatiens capensis, and jewelweed has some interesting features that make it worth getting to know. Its common names, jewelweed and touch-me-not probably come from the characteristics of the flowers and seeds. The bright orange blossoms have a jewel-like quality and stand out against the green foliage. The swollen seedpod on this plant looks ripe and ready to pop. You might expect a plant called “touch-me-not” to be toxic or irritating to the skin. This is not the case. The name comes from a little seedpod surprise. When they are ripe, a slight disturbance will cause them to pop open and squirt their seeds out. We have to assume that someone called it “touch-me-not” after touching a seedpod and having the seeds shoot at him. Maybe it seemed as if the plant was reacting negatively to his touch. Rather than a defense mechanism, shooting seeds is an effective dispersal strategy, as it sends the seeds away from the mother plant where they might have a better chance to sprout and grow. Viewed from above, the characteristic oval leaf shape and a seedpod growing from the center stem are evident. 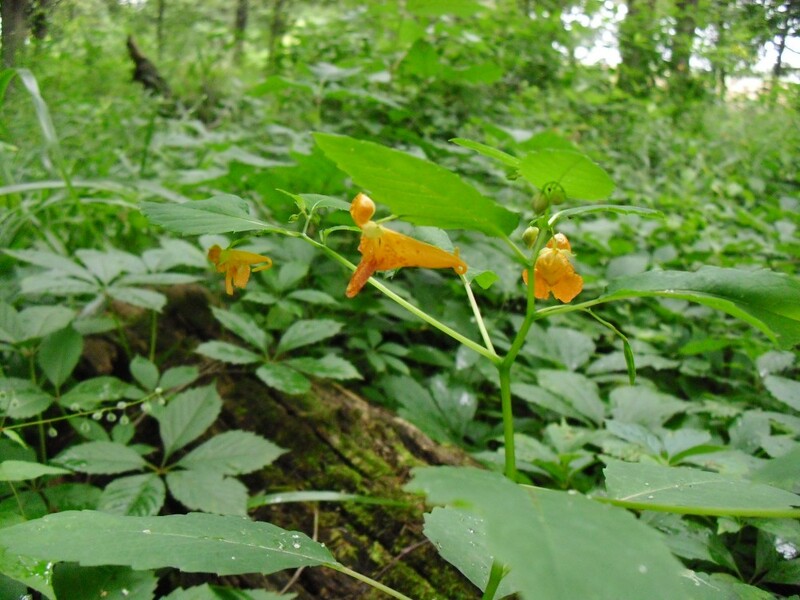 Finding jewelweed in the forest right now may be a little tricky because there aren’t many flowers remaining. Get to know the leaves—they are oval-shaped with a gently pointed tip, and have slightly toothed edges. The stem is thick and a translucent light green. Jewelweed has some other interesting qualities. Native Americans squeezed the juice from the stem of jewelweed and applied it to poison ivy rashes and other skin ailments for a very soothing treatment. It is ironic that “touch-me-not” is a cure for “leaves of three—let it be,” don’t you think? Folklore tells us that wherever you find a toxic plant, you will find its remedy growing nearby. It’s a nice idea, but it may not be true. 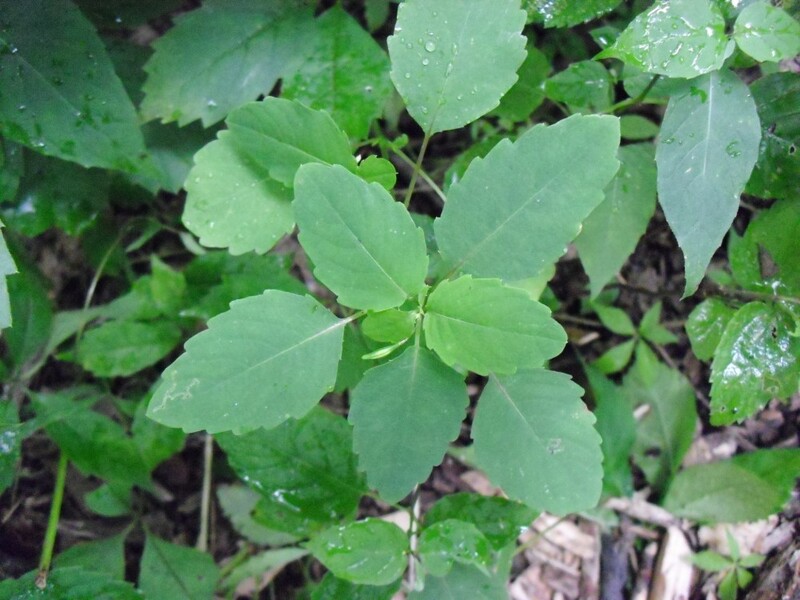 That said, you will probably find poison ivy growing near jewelweed, so use caution and be careful not to touch when you are searching for this plant. It’s growing in my yard like a weed. Too much of it. Sometimes I pull it. Thanks for the info on poison ivy relief. It does have a pretty flower. Previous Previous post: Meet the Interns!